When we were first married, one of the first Christmas decorations I bought was a ceramic light up house that I bought at a discount retailer. Over the years I picked up a few more, and it became one of Jon's favorite Christmas traditions- seeing the village all set up and lit. But, in the last couple years, as much as I enjoy our wintry little neighborhood, I was ready for a bit of a change. 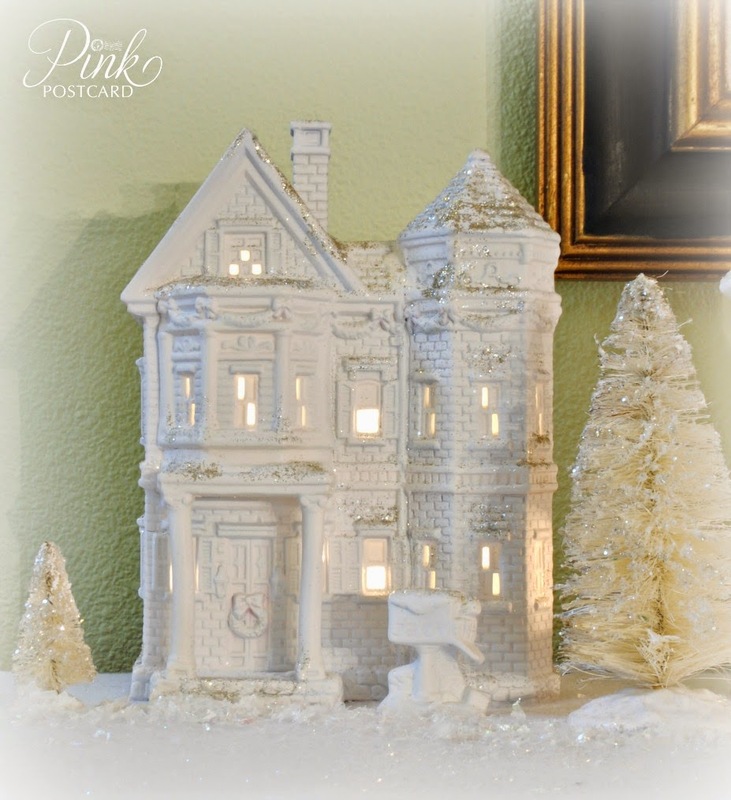 I love the old Putz glitter houses, (and even some of the new renditions) but I couldn't justify getting rid of something Jon loved for something different, while still being the same idea. I made sure he was ok with my plan, and now we both love the update! On a rare dry day a couple weeks ago, I took the village outside and spray painted it with Rustoleum's Flat White. 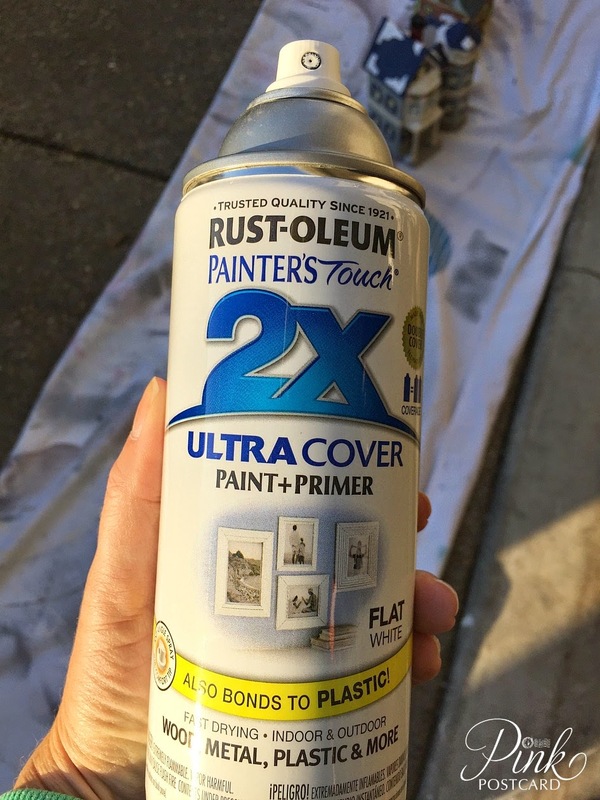 In the past I've just used Rustoleum's primer, but it has a blue cast to it, and this is a nice white tone. Once it was completely covered, I used a mix of Martha Stewart's White Gold fine glitter, and a white glitter. 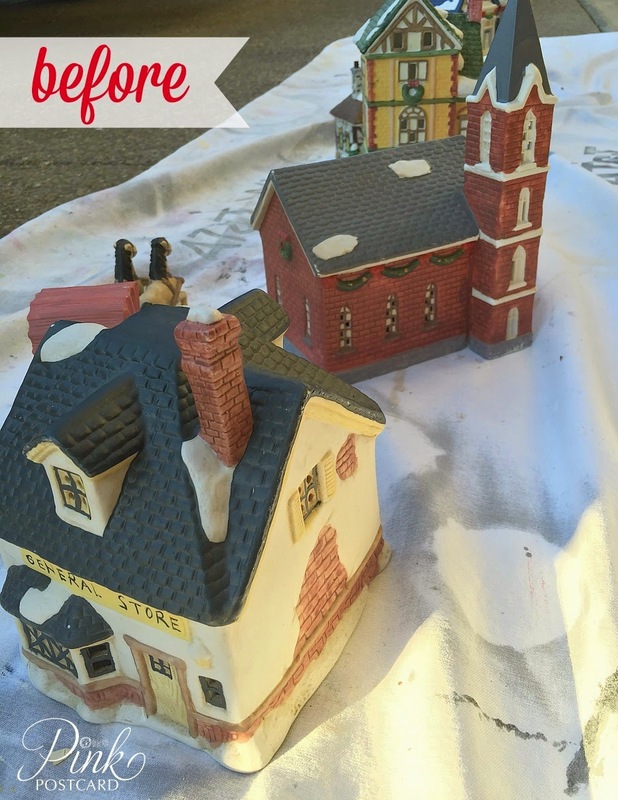 With a foam brush, I applied Mod Podge (you can use white glue too) and painted it on the areas where you would see snow collect on a house. I only did small sections at a time so the glue was wet enough for the glitter to stick to. Also, if the house had a spot where it had a raised area from where the snow was originally painted on, I used the glue there as well. There's something about using glitter that is just fun no matter what age you are! I let these dry for a couple hours, and then set up the village where we've had it the last few years. With the update, I used white bottle brush trees, and it created the glittery snow village I wanted! Super easy, and a quick project on something we've had for a long time. 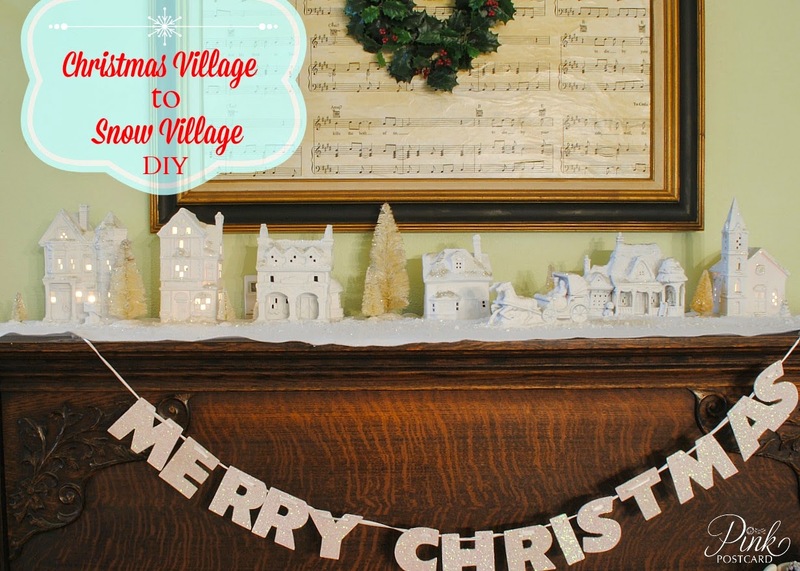 On a final note: I see a lot of these showing up in thrift stores these days, so if you like the look of this and have never had a Christmas village, you can start your own snow village pretty quickly with a weekend shopping trip. 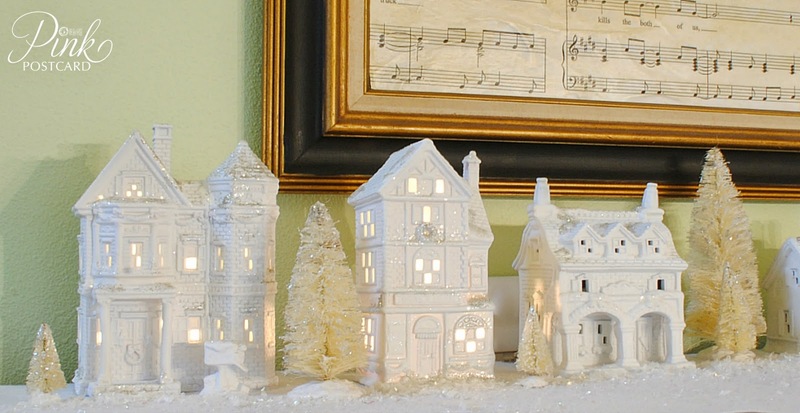 If you do find these at thrift stores, please be aware that most will not have the electrical cord and bulb anymore, but you can always add a battery operated tea light if the bottom is big enough to allow it, or just use a small string of white twinkle lights to poke in the bottom where the bulb would go. Also, I was not asked by any company to endorse their products here, these are all items I love to use on a regular basis. Great idea! I found a nativity scene at a thrift store a few years ago that was poorly painted. I spray painted it white, and it looks timeless now. I always walk past the village houses. I'll have to give them a second look now. Your village set turned out great. I find white always gives things a fresh look. Love this idea....looks beautiful. 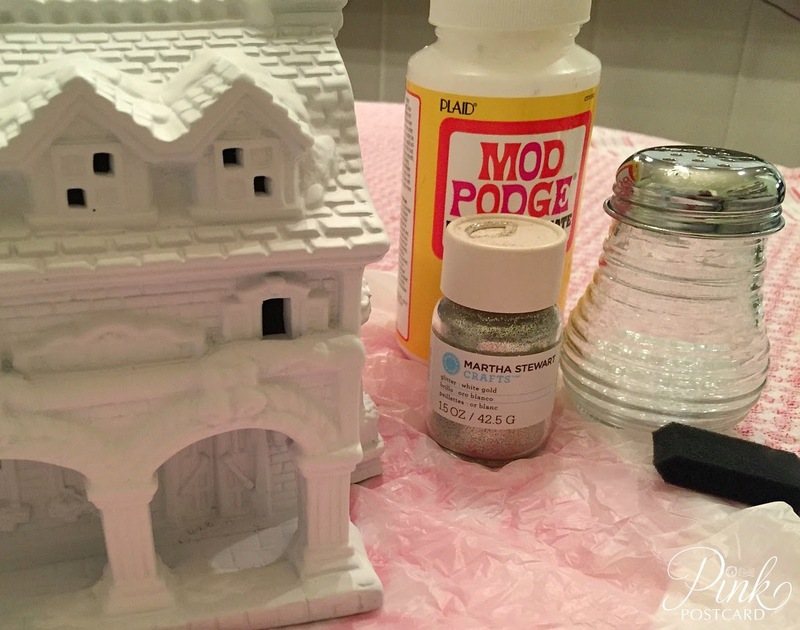 FYI, "Mod Podge" is my favorite go to craft glue and I also am a big fan of "Martha Stewart's Living" Metallic Paint that I use on everything and have a jar that last forever! Thanks for sharing your tutorial!